There is a need to develop simple, noninvasive, and sensitive outcome measures for respiratory therapy. Adventitious respiratory sounds (ie, crackles and wheezes) can be objectively characterized with computerized respiratory sound analysis (CORSA) and have been shown to contribute for diagnosis purposes; however, their potential for use as outcome measures is unknown. The main objective of the participating centres was to develop guidelines for research and clinical practice in the field of respiratory sound analysis. Respiratory diseases are a major cause of societal, health, and economic burdens worldwide. Therefore, in the last decade, significant research efforts have been dedicated to improving early diagnosis and routine monitoring of patients with respiratory diseases to allow timely interventions. However, addressing these issues has been highly challenging since available respiratory measures such as spirometry are dependent on patient motivation and cooperation, and other tests such as blood gas analysis and imaging are not available in all clinical settings and are expensive. 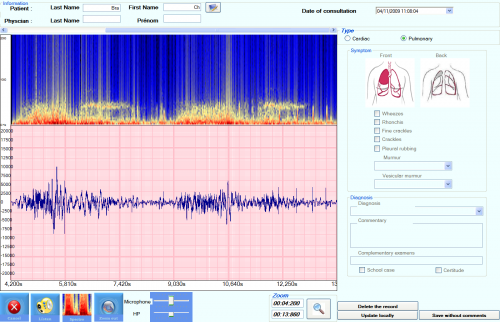 Computerized respiratory sound analysis (CORSA)consists of recording patients’ respiratory sounds with an electronic device and analyzing them based on specific signal characteristics, is a simple, objective, and noninvasive method to detect and characterize adventitious respiratory sounds (ARSs), ie, crackles (CRs) and wheezes (WHs). ARSs provide crucial information on respiratory dysfunction, and changes in their characteristics(eg, intensity, duration, timing) might inform the clinical course of respiratory diseases and treatments. Through the use of CORSA, ARSs have been found to be a more sensitive indicator, detecting and characterizing the severity of the respiratory disease before any other measure. Thus, this approach, through objective data collection and management, generation of permanent records of the measurements made with easy retrievability, and graphic representations, assists with the diagnosis and monitoring of respiratory diseases. Sounds recorded from the respiratory system were captured by microphones or contact sensors situated at the mouth (free field), on the chest or elsewhere. Other physiological signals were commonly captured alongside the sound. For example, airflow, change of lung volume and/or intra-thoracic pressure and oxygen saturation. Computerized lung sound analysis involves recording the patient’s lung sounds via an electronic device, followed by computer analysis and classification of lung sounds based on specific signal characteristics. Computerized lung sound analysis performs at a relatively high level of sensitivity and specificity in a small number of studies. Overall sensitivity for the detection of abnormal lung sounds using computerized lung sound analysis was 80% and overall specificity was 85%. However, that there is a lack of standardization across studies in the methods used for lung sound recording, computer algorithms for signal analysis and statistical methods for outcome analysis. ↑ World Health Organization. The World Health Report 2008: primary health care—now more than ever. World Health Organization, Geneva, Switzerland 2008. ↑ Hayes D Jr, Kraman SS. The physiologic basis of spirometry. Respir Care 2009;54(12):1717-1726. ↑ Marques A, Bruton A, Barney A. Clinically useful outcome measures for physiotherapy airway clearance techniques: a review. Phys Ther Rev 2006;11(4):299-307. ↑ Sovijarvi ARA, Dalmasso F, Vanderschoot J, Malmberg LP, Righini G, Stoneman SAT. Definition of terms for application of respiratory sounds. Eur Respir Rev 2000;10(77):597-610. ↑ Marques A, Bruton A, Barney A, Hall A. Are crackles an appropriate outcome measure for airway clearance therapy? Respir Care 2012; 57(9):1468-1475. ↑ Vyshedskiy A, Murphy R. Crackle pitch rises progressively during inspiration in pneumonia, CHF, and IPF patients. Pulm Med 2012; 2012:240160. ↑ Gavriely N, Nissan M, Cugell DW, Rubin AHE. Respiratory health screening using pulmonary function tests and lung sound analysis. Eur Respir J 1994;7(1):35-42. ↑ Sovijarvi ARA, Malmberg LP, Charbonneau G, Vanderschoot J, Dalmasso F, Sacco C, et al. Characteristics of breath sounds and adventitious respiratory sounds. Eur Respir Rev 2000;10(77):591- 596. ↑ Sovijarvi ARA, Vanderschoot J, Earis JE. Standardization of computerized respiratory sound analysis. Eur Respir Rev 2000;1 (77): 585. ↑ Pasterkamp H. Acoustic markers of airway responses during inhalation challenge in children. Pediatr Pulmonol Suppl 2004;26:175- 176. ↑ Murphy RLH. In defense of the stethoscope. Respir Care 2008; 53(3):355-369. ↑ Doherty M, Wang L, Donague S, et al. The acoustic properties of capsaicin-induced cough in healthy subjects. Eur Respir J 1997; 10: 202–207. ↑ Pasterkamp H, Kraman S, Wodicka G. Respiratory sounds. Advances beyond the stethoscope. Am J RespirfckLRCrit Care Med 1997, 156: 974–987. ↑ Piirilä P, Sovijärvi A. Objective assessment of cough. Eur Respir J 1995; 8:1949–1956.